We've released the beta version of Georneys. It's been a long journey. Gearneys currently has minimal features, and there are things we'd like to change and improve, but we're happy to have made it to beta. It's tough to get software cranked out amidst all of our obligations, including creating cash flow (i.e. doing contract work), raising two wonderful little boys, and trying to sell our house. My wife, Heather, deserves all the credit for relentlessly pushing Georneys forward. As we prepare for the beta release of Georneys, I’m beginning to wonder if the best approach to the lost child problem is to provide Georneys as a subscription service in places where it’s needed most (places like theme parks and zoos). Georneys would be free for anyone to use, but theme parks and other attractions could use Georneys as their “lost child” system. The advantage to the organization is that the child’s description and guardians contact information would already be recorded and it could greatly improve efficiency and effectiveness when dealing with lost children. Describing her experiences with lost children, one Cast Member said, "It happens to good parents!" There are a few ways to help kids carry this information safely. A name badge on a necklace (such as from tour groups or conventions) can be worn inside a child's shirt. A sticker can be stuck inside a child's pocket. One resourceful adult had two ten-year olds pull up their t-shirts and she wrote her cell number with a ball point pen on their upper arms near their shoulders! These techniques keep such information private but make sure that the children have it if they need it. Since its inception earlier this year, Georneys' mission was to help reunite lost children with their parents or guardian. By “lost” we meant young children who become lost in places like Disney World or at the zoo; we weren’t trying to tackle the problem of abducted children. The idea was in response to one of our concerns; we take a few trips to Disney World each year and we wanted to make sure that our children remain safe. We've never lost one of our children, but we did understand how quickly a child could become lost in a place like Disney World. Months ago, when we started Georneys (before it was named Georneys), we did a lot of research about lost children. We couldn’t find many statistics on the subject, but the information that we found suggested that lost children are indeed a problem for amusement parts (metal note: it's a problem for amusement parks). We also surveyed parents of preschool aged children about the Georneys service and ultimately decided that Georneys was a good opportunity to pursue as well as being a useful and beneficial service for parents and families. One thing we didn’t do was to ask the question, “What happens when a child gets lost in a place like Disney World?” I think the answer to that question might have led us down a little different path. In the typical scenario, when a child becomes lost, they start crying. Usually, a kindly stranger stops by, asks the child what’s wrong, and helps the child locate the parents or takes the child to a park employee or park security. From that point, the main issue is that the park has to find the parents. That’s probably not too difficult because the parents will probably try to enlist the park employees or park security in their effort to locate their lost child. I don’t have any statistics, but I’d bet that’s a fairly quick and efficient process since a lot of information can be passed over the phone lines. When we started out working on Georneys we assumed there was a lost child problem and we continued to assume that as we built the service. Along the way, we probably should have been asking broader questions, like, “What do you do when your party becomes separated at an amusement park?” When we go to Disney World, we often separate for a short time. My oldest son often wants to go on a ride that isn’t appropriate for my youngest so we’ll split up into two groups. When we do that, we use cell phones to stay in touch (most of the time it’s voice, sometimes text). Often, it’s a real chore to stay in touch because I can’t hear the phone ring or feel it vibrate and it’s often difficult to have a conversation on the phone. Anyway, when we go to an amusement park, our problem hasn’t been lost children, our biggest problem has been reuniting with our group after we’ve split up. The first thing we did was toss out any pretense of solving everyone’s problem. There is an old proverb that I just invented for this situation -- “The boiling of the ocean begins with a single puddle.” We had to define our puddle. So we did. A friend of mine told me a few weeks ago that Snapfish is driven by a product team that thinks a hypothetical mom named Emily is their user. Their design mantra is What Would Emily Want? We went out and defined our Emily. The next thing we did was develop a hypothesis of the ways in which web application integration would please that Emily i.e., what is her pain? What is she trying to do? What web services does she use to do it? And how does she cope with using 3-5 discrete web applications to get something done? What does she do now? Then we went out and talked to a small army of Emilys. Arrgh! This will strike everyone as obvious and necessary. It is. And we hadn’t done it before because we were too busy building. We should have defined Emily a long time ago and asked her and all of her friends about their pain. We probably would’ve saved ourselves a lot of time and energy. We’re going to find Emily (she’s got a Georneys ID) and solve her pain. Heather and I have had a lot of parents excitedly remark that Georneys is a “great idea” and they’ll rave about it; at least when we’re present. I think they really believe it’s a good idea, and I think they intend to use Georneys, but we generally find that they don’t run to the nearest computer and sign up for an account. I think that kind of behavior is probably one of the biggest barriers to marketing Georneys. Although the sign-up resistance may in part be due to the fact that it’s an alpha version, I liken Georneys to flood insurance; people don’t often buy it unless compelled by some outside force such as rising water. That’s a difficult problem. And, we have another problem: the “lost child” service that Georneys provides is not something that creates constant return visits to the site which means it not the best venue for becoming an advertising supported site. Thus, paid subscriptions are probably the most reasonable means of supporting the service. 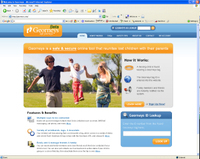 To help alleviate those issues, we’ve been exploring the possibility of adding a service to Georneys that will help families answer the question, “where do we want to go today?” That would be a complimentary service to the lost child service and could potential boost the lost child service as well as providing additional sources of revenue. The problem with the "two services" approach is that we’re hoping that one service will help bolster another service. For a startup, it’s hard enough to get one service pushed out the door, much less two services. I think the two service approach is a poor strategy at this stage. As we head toward the beta release of Georneys, I think we have two choices: 1. find a reasonable way to overcome the “sign-up resistance” and grow the lost child service, or 2. morph into something different. We have some research and head-scratching ahead of us. We released the Georneys alpha version today. Anyone is welcome to sign-in and give it a test drive. We already received some feedback and we know of a couple issues (aka bugs) that need to be fixed, but overall, things seem to be going very well. If you do give it a test drive, please give us some feedback; good bad, or indifferent. Sometime soon I’ll have to write a comprehensive post about some of the things that we’ve learned while building the alpha version. One of our biggest issues was simply trying to keep things simple. We built and subsequently scrapped a lot functionality along the way. Some of the functionality will reappear in the future, but for now, we’re going with the simplified version. We’ve also changed our business model just a tad. We decided to go with the freemium model for now. We’ll have a free entry-level version and later we’ll provide a premium version with additional features. Again, please give it a test drive at Georneys.com. Thanks in advance! Heather and I have been working away on the alpha release of Georneys. The sole focus of the alpha version is on the “lost child” problem; to provide a means to have lost children returned to their guardian(s) quickly and safely. However, as part of the Georneys “product mix” (service mix?) we’d also like to help families answer the common weekend question, “Where should we go today?” We’ve found that parents often have a difficult time finding new and fun things to do with their young children. Families typically do the same things over-and-over again; go to the same park, mall, and restaurant. I think a lot of the repetitive behavior is because familiar things are a known quantity, and with small children, a familiar routine is often welcome. But, I think a lot of the “sticking with the familiar” behavior is because it’s often difficult to think of new places to go and there’s little time to research and think about it, so the familiar is the default. As I’ve given more thought to the “Where to go, what to do?” question, I've seen a number of opportunities to use the internet to help solve the problem. It’s really an interesting problem and I think most of the current approaches are a bit weak. What I see very often is that places and events are visually presented on a map (Google Maps, Microsoft Earth and the like). I think that’s probably a mistake. If I’m looking for fun places to go, I’m concerned about the distance of the place and the time it takes to get there, but I don’t really care about its location on a map – until I need directions to get there. I think maps are very useful, but when my question is, “Where is a fun place to take the family today that within an hour and a half driving distance that’s will fit my budget?” I don’t really want a map. What I want is really good, targeted suggestions of places and events that the whole family can enjoy. Reviews are good too, but I don’t (and probably can’t) spend my day reading reviews; I want a good summary. The other issue I have with current services is that user reviews may not always be the best indicator of “what’s good.” Actual behavior is probably a better indicator; I think it’s somewhat analogous to the attention issue with web content. Behavior is important, so I think feeding a “where to go/what to do” system with actual data would be very useful. Fred Wilson talks about some of these issues in his post titled “Taste Neighbors.” It’s a great post and points to a lot of good opportunities in the user generated ratings and reviews space. Needless to say, I’m excited about working on some of these problems. Georneys is so close to being ready for alpha testing that we can taste it. Heather has cut back on her contract work so that she can focus on the final details. It's tough to build a business on a part-time basis, but we can feel the momentum building. We're looking forward to the alpha and the beta versions. Once the beta is ready, we have a number of people who'd like to use Georneys. Then, our focus will shift to building a user base, getting feedback and improving the service.